Find out how to make rose water, and to use the rose water as the base for rose water facial toner in a decorative bottle. The gentle astringent qualities of rose water have long been used as a refreshing facial splash. The addition of witch hazel (also an astringent, and an extract from the hazel tree) improves the toning abilities of this mildly rose scented herbal concoction. The decorative bottle used here could also serve as a gift bottle for other preparations, including herbal vinegars or oils. The bottle shown is a recycled olive oil bottle, although similar bottles are sold reasonably in dollar stores and craft stores and there are many other food bottles that could be recycled in this way as well. Place the rose petals in a saucepan and cover with the water. Simmer over low heat until water is reduced by half. Let cool and strain out the petals. Store in sterile jar or bottle. 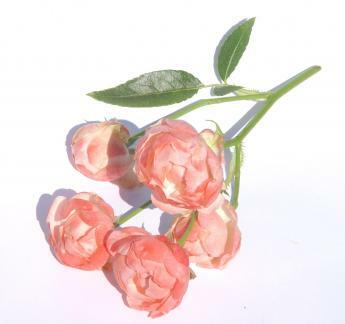 Rose water, alone, makes a very gentle astringent facial toner. The addition of witch hazel and glycerine adds more astrigency and moisturizing qualities; use less glycerine if your skin is oily, more if your skin is dry. Combine ingredients and decant into a decorative bottle. Moisten a cotton pad with toner and apply to your face after cleansing but before moisturizing. I’m unsure of how long this toner will store at room temperature. Commercial preparations usually include alcohol, which can be very drying to your skin, but extend storage time. I would therefore recommend refrigeration to extend storage time. I came upon this great how-to video recently, showing the steps involved in a steam distillation of rose water that you can do on the stove at home. I haven’t tried this method myself as yet, but it’s definitely on my to-do list when the roses bloom this summer.